The other would be an auto rebuy if you run out of chips. Instead of auto reloading up to a certain stack. It would be useful if your stack hits zero it auto rebuys you to the minimum. player1234 wrote: It would be nice if the note popups would be formatted in a more useful manner. With actual line breaks and consistent size. The format available now just makes one long string that changes in size so its difficult to sort through the notes in game. Using actual line breaks would work well, or just use word wrapping with a consistent size popup. Not sure what you mean by "consistent size". Could you show an example? Regarding the line breaks, it does show them when you display the note editor, just not when hover over the avatar. But I'll take a look at it. 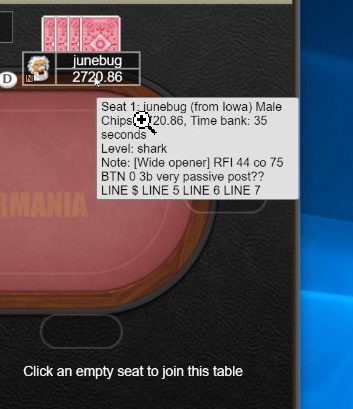 In a tournament, you immediately get a prompt to rebuy or double rebuy if you go broke so it's just one click away. There shouldn't be an account balance debit without the player's expressed permission. and while the line breaks do show up in the note editor those line breaks do not transfer to the note popup. In the note editor there is an enter pressed after LINE 1 but that enter/line break does not carry over to the note popup. Ok, I've fixed this for the next update. The line breaks will be replaced with <br> tags and a max-width property will be set for the popup to roughly half of the table width. Seats close to right edge will still have a tall skinny note but the others will no longer stretch across the whole screen. Note formatting now fixed in 5.18.